The holidays always remind us about the friends and family we’re so lucky to have. 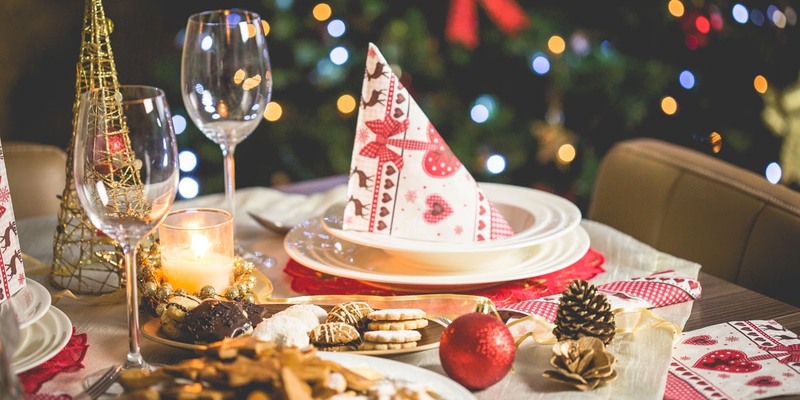 Throwing a holiday party, whether it’s a yearly tradition or something new you wanted to try this year, is a great way to share the love with those people who laughed with you through another year. Christmas parties are a chance to do it up big! Make your party one to remember by adding these five details! You’ve decorated beautifully for your event! Your tree is trimmed, the house is aglow, and everything is sparkling. Having a few dishes that match your overall color scheme is a great way to welcome your guests and let them know they’re in for a holiday party unlike any other! If you’ve got a traditional red and green look going, we recommend Caprese Salad. 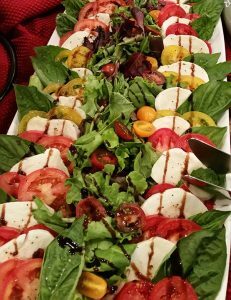 The tomatoes, mozzarella, and sprigs of basil leaves look like edible Christmas decorations, not to mention that they taste amazing with a balsamic drizzle! Since the best parts of any party happen around the table, you’ll want to make sure that you’ve got a beautifully laid table. 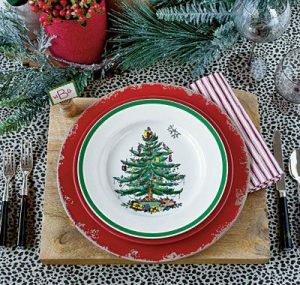 Luckily, the holiday season lends itself to some truly spectacular tablescapes that are so easy to create. We recommend choosing either a stunning tablecloth or an over the top set of Christmas china. If you go big on both, the effect tends to be a little overwhelming so choose your favorite. If you’ve got an entire set of Spode Christmas dishes, set them off by either leaving them on a simple wood table or on top of a modern monochromatic tablecloth. Add in some gorgeous glassware, name cards accompanied with a bundle of holly, a centerpiece made of pine, fir and white roses, and you’ve got a stunning Christmas table! Silence begets silence, and noise leads to more noise. If you want your guests to talk and mingle make sure you’ve got some music playing in the background. For a Christmas party, the musical selections are endless! There’s tons of holiday songs to choose from! Try some modern, pop Christmas songs as guests arrive to get them in the mood for fun. Then you can transition to instrumental versions of carols for dinner. It’ll be festive, but no one will have to talk over Mariah Carey to be heard. ‘Tis the season for giving! 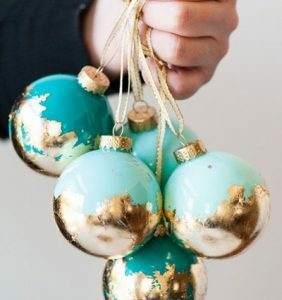 You’ve filled your guests bellies, created an evening full of conversation and laughter, finish it off right by sending your guests home with an ornament. It doesn’t have to be anything over-the-top or expensive. You can find tons of cute ornaments for just a few dollars. Even better, it’s a gift they can go home and put on their tree right then! After opening your home for an amazing event, display your Southern hospitality even more by making sure your guests don’t go home empty-handed. We had a great hostess who left ornaments for her guests in a basket for everyone to grab one on the way out! Meanwhile, add chocolate chips to a small microwave-safe bowl and microwave in 30 second intervals until melted, stirring between each one. Dip the rim of your mugs in the chocolate and then in the crushed graham crackers and set aside. In our family usually, we celebrate Christmas in a grand manner. This year we wanted to make it more special as many of our extended family members were taking part in it. The article posted above helped to plan for the event in a grand manner. We also arranged for a delicious dinner party on the eve of Christmas. We had a great & memorable Christmas this year. I am in search of a right caterer for my daughter’s wedding who can offer personalized menus like the one mentioned in the above post. It is important that the caterers understand the choices and expectation of the couple. The above post is a true example of a perfect dinner for a wedding event. Some really great tips here, especially matching appetizers to your colour scheme. Never would have though of that. You have to shared really great tips here. Such a nice post. thanks for your sharing. 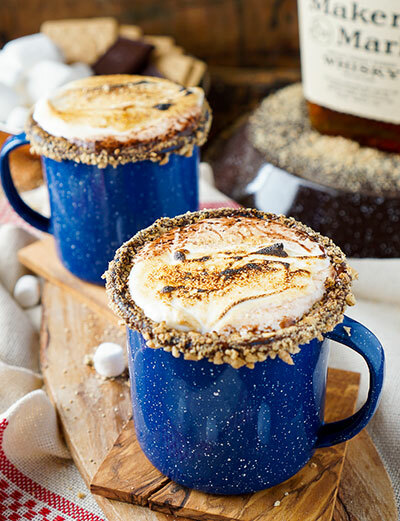 Wow, those campfire s’more cocktails look great. I bet that my sisters guests would love to have those drinks for her Christmas party. Her house gets really cold in the winter and these drinks would help to warm the guests. I am also going to suggest that she gets her furnace repaired.